Dancing for an unresponsive audience. Performing in public takes serious nerve. And nothing breaks your nerve like an audience who ignores you, doesn't react to your performance or worse, reacts negatively. Today I'd like to explore how this happens, and how not to let it ruin your performance. Some performance venues carry a stronger potential for a tough crowd. It's important to prepare well for these and not rely on the atmosphere to carry the performance. If you are a nervous performer, or struggle not to take the audience reaction too personally, you might want to consider avoiding them. A promenade stage is a performance area where the audience is "passing through". It might be a high street, shopping arcade, carnival or fete. Essentially you don't have a captive audience and you may find that the vast majority of people walk past without casting you a second glance. If people aren't expecting to see dance, they can be a more reluctant audience. It might be a fete, art show, music event or street performance, but if people are there with a purpose other than watching dance, they are liable to be less enthusiastic. This is a tricky one to predict. Often when a dancer turns up to a party performance, the atmosphere is great, the dancer is welcome and everyone gets in the spirit and has a smashing time. Sometimes it takes a bit more coaxing. Bellydance still suffers a little with the reputation for being a bit risque. There are still times when a dance performance is booked to gently embarrass the guest of honour, and that can be awkward for everyone. On the other hand you might find the guest of honour and organisers really "get" your performance, but other guests are uncomfortable or unpleasant. If you are heading off to your local friendly hafla, it doesn't always matter if you are a bit unsure of yourself, because it is a safe space. Most haflas are supportive and fun, and they know what you are facing. You can get away with assuming that the audience will carry you a little. If I am trying out something new, I will always do it in a safe place among other dancers who understand the process, not for the general public. If you are up for a tougher gig, your set needs to hold up on its own. Think about making it suitable for the occasion. Think about how to catch their eye and hold their attention. Use music that excites you and wear a costume that you feel fabulous, not self-conscious in. "They didn't like my performance"
"They looked at me disapprovingly"
I have heard all of these from dancers after a tough performance, but the truth is that you just can't tell what is going on in your audiences' thoughts. On more than one occasion I have had an audience member who sat with their arms folded and apparently scowling, go out of their way to tell me how much they loved my performance. You don't know how someone's day is going, you can't say that the person who rushed past your stage area glowering wasn't just late for an appointment or hungry, or just had a row with their partner. Let it go. It is your job to perform and present your art. It is not your job to control how it is received. If you have put the work in to present an appropriate and skilled performance, you have not failed. Of course some people will react genuinely negatively. You can hear their concerns if you choose, but remember that not all critique is valid or necessary, process it as you will. Find someone to dance for and focus on them. 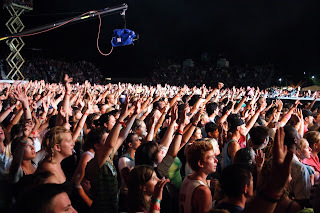 In most audiences you will find someone who is into your performance. So dance for them. Don't make it creepy and actually just dance at them, but know that they are there and they are a reason to keep doing your best. You might have just instigated some major revelation or change in that one person, that makes it worth it. Don't let them down. Why do you dance? 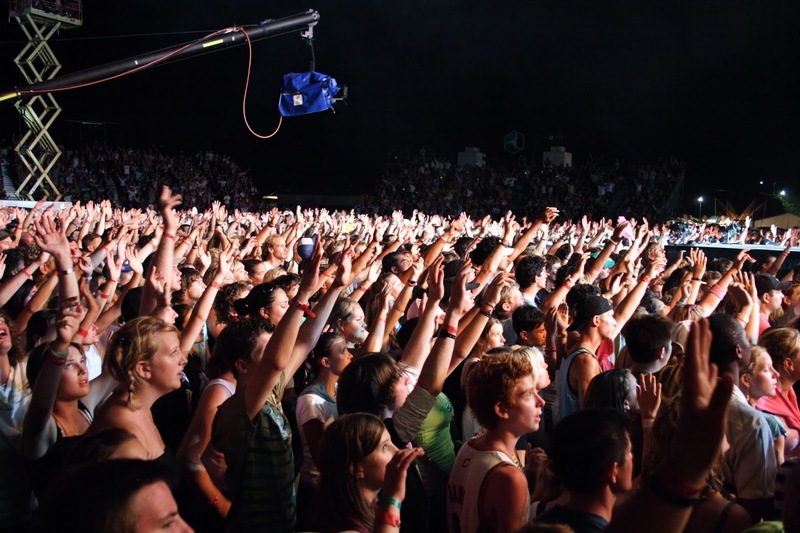 Do you perform solely to gain appreciation and gratitude from your audience? If so, that's OK, but you will need to choose your performance outlets accordingly. What about the other reasons? Are you trying to share the art and raise awareness of your danceform among the public? Know that not everyone who is inspired or interested by the dance is going to respond with rapture and gushing from the outset. Sometimes you are just planting a seed. Being visible and letting people know that it is possible to dance, to dance with curves, or with age, as a woman, as a man - you are making an impact, even if you can't feel it at the time. Are you dancing to express yourself? then dance, send out your message to the world. You won't always make waves, but the act of expression remains. Or perhaps you are dancing because you just love the music, and just love to dance. So keep doing it. Nobody can take that joy away from you, even if you offer it to share, and they choose not to accept. Or just imagine these guys in place of your actual audience. A rare and lovely opportunity arises this week for lovers of music and dance in Glastonbury. So don’t miss your chance to see live Arabic music with not one, but two fabulous dancers - and it’s all for a good cause! The Laylet Amar Ensemble (Night of Hope) is a collaboration featuring local dancers Oona La Luna and Kash Salem performing alongside musicians Michael Burridge (oud/riq), Elvin Herrick (darbuka/guitar) and Mark Ommadom (darbuka/frame drum). This is a brand new grouping, created especially for this occasion where they will be performing alongside some of Glastonbury’s most popular local performers. 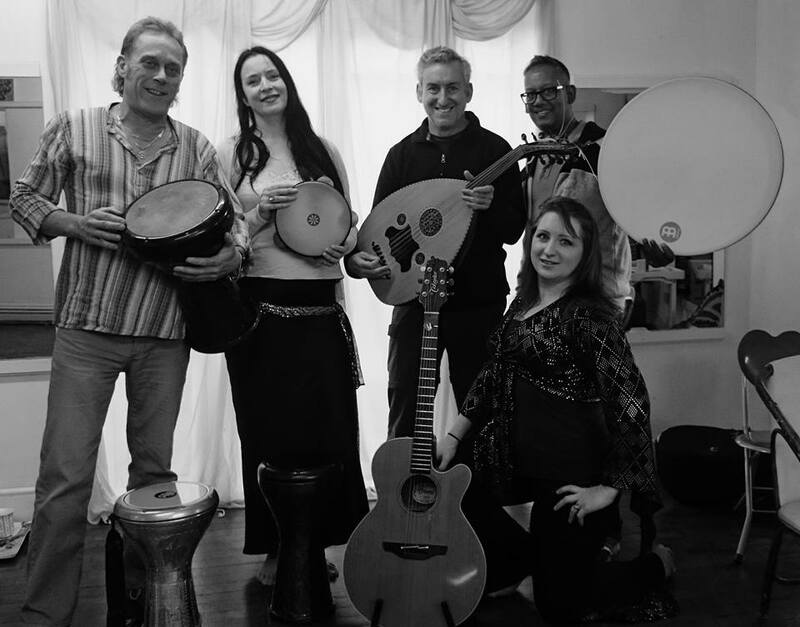 Expect a set of popular Egyptian music, enchanting and lively, to bring balmy Arabian nights to the chill of our Somerset autumn. To catch their debut performance, and a night of music, song, dance and poetry, come along to the Gaia’s Union Refugee Crisis Fundraiser, in the Glastonbury Assembly rooms, from 8pm on Thursday 29th October. Suggested donation £3. L-R Mark Ommadom, Oona La Luna, Michael Burridge, Kash Salem, Elvin Herrick. No dancer is an island. Recently I have been up to my ears in all sorts (apologies for the blog absence) and a lot of that has to do with collaborations! I wrote recently about my ongoing work with Doum Tekka, our resident darbuka player, which, apart from brief work with musicians - like the Miss Bellydance UK competition in 2013- represents the sum total of my work with others since leaving Juno in Weymouth. All of a sudden I have 2 separate collaborative performances happening in the same week! Firstly is on Thursday 29th October in the Glastonbury Assembly rooms. Gaia's Union is putting on a night of entertainment from local performers to raise money for Syrian refugees. Laylet Amar is a collaboration involving local dancer, Oona la Luna, myself, and musicians Mark Ommadom, Elvin Herrick and Michael Burridge. We are doing a set of around 20 minutes including musical favourites. Also performing are a whole bunch of brilliant local bands and performers. If you are local, you should come. I'm really looking forward to rehearsing with these guys over the next couple of weeks. I've danced to Elvin's fantastic drumming before in training, but otherwise this is the first time I have performed with any of the collective, so it's all very new and exciting! In contrast, the next collaboration of the week is with my oldest dance peer. We've known each other since before either of us started dancing, and it was witnessing her love of the dance that inspired me to seek out a good teacher after a disastrous first few lessons nearly put me off dance entirely. We train together with Alexis Southall, but actually, we've never performed together before either! Kitty Kohl and I are dancing together at the Glitterball Shakedown - The Infusion Emporium festival's notorious afterparty. Living on opposite sides of the country has made choreography and rehearsal a bit tricky, but it's looking great so far and I'm really looking forward to performing in Wolverhampton on November 1st. Infusion Emporium, guaranteed epic dance times and you can still book in.